Paul Knudstrup is president of Midwest Consulting Group, Inc. based in Kalamazoo, MI. He has been involved in the training and development field for more than 30 years. In addition to consulting for a wide variety of clients he has designed and delivered training programs for more than 100 organizations from across the globe. His extensive knowledge of organizations, management, and leadership and decades of actual management experience have given him a wealth of practical experience. Paul’s personal areas of interest and expertise include organizational strategy, leadership, personal productivity, management development, action planning, nonprofit fund development, and executive coaching. His academic background includes BA, MA degrees from and post-masters work at Western Michigan University. In addition to working with corporate and nonprofit clients, Paul has served as faculty, speaker, or workshop leader with a number of universities. A native of central Michigan, he is married with one daughter and granddaughter. In his spare time he is a private pilot, plays jazz flute for fun and includes vintage auto racing among his interests. Mary Jo – Thank you for the excellent interview and post on your blog. 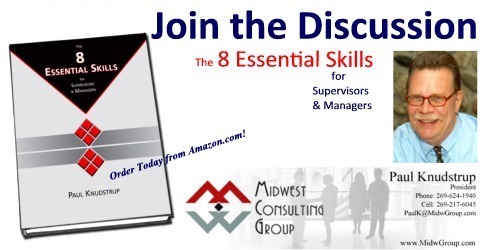 Your coaching, advice, and support have been a big help in getting The 8 Essential Skills from concept to reality.